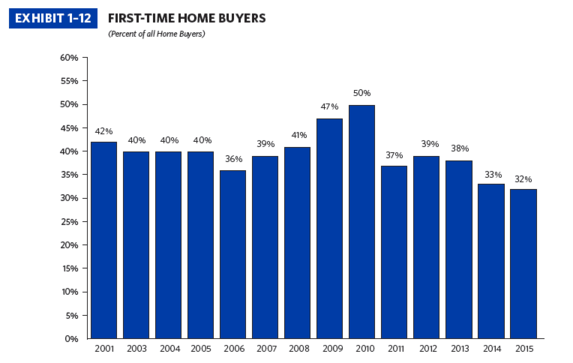 Think it’s tough to be a first-time home buyer these days? Well, you’d be right. The National Association of Realtors announced today that the first-time home buyer share hit its lowest point since 1987, and the second lowest point since the group began tracking such data back in 1981. The 2015 National Association of Realtors® Profile of Home Buyers and Sellers revealed that the first-time home buyer share slipped to 32% from 33% a year earlier. While bad and worsening, it’s not quite as bad as the 30% share seen in 1987. Ironically, it has been 28 years since it hit that all-time low and there’s a good chance there are plenty of 28-year-olds out there looking for their first homes today. The first-timer share continues to sit several percentage points below its long-term norm of about 40%. If you’re wondering why, it could have something to with coming up with the down payment necessary to purchase a home. Per the survey, first timers reported debt of all kinds delaying their ability to save for a down payment by a median period of three years. And of those who indicated saving was the most difficult part, student loan repayments were the culprit for 58% of respondents. Even if prospective buyers don’t have any debt, a combination of high rents and increasing asking prices means it’s tricky to set aside the money necessary to fund a down payment. To make matters even worse, inventory continues to be an issue for all home buyers, especially when it comes to entry-level homes. Throw in the fact that there will likely be multiple bidders and your minimum down payment of 3% or 3.5% may need to climb to 5-10% to get any notice. Will First-Timers Get the Short End of the Stick? Sadly, this is all happening at a time when mortgage rates have never been much lower. It’s almost a cruel joke for those looking to get in on what appears like the chance of a lifetime. In reality, these folks might end up buying homes at the peak of the market, similar to what happened in the prior boom. I’m not just saying that. A report released by RealtyTrac yesterday said homeowners who sold during the third quarter realized the highest average price gain since 2007. The average gain was a healthy $40,658 (17%) from the original purchase price of their property. Amazingly, the average seller only owned their home for 6.72 years, basically just after the worst of the latest housing crisis. 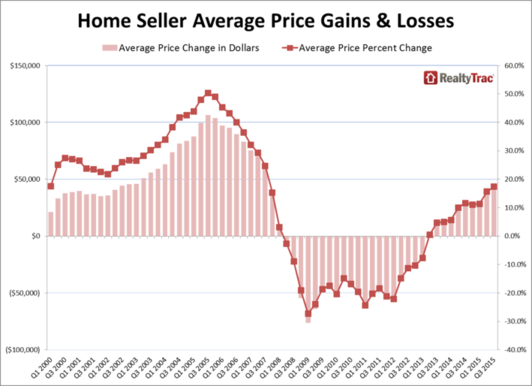 It may be a great time to sell because the average sales price during Q3 was $263,976, up just 0.2% from the second quarter and 2.4% from a year earlier, the slowest year-over-year price gain in any quarter since the home price bottom back in the first quarter of 2012. In other words, things might be topping out, so if and when first-time buyers finally land a home, it may not be the best deal, even if their mortgage rate is super attractive. If you’re wondering who the successful first-time buyers are, read on. NAR said the median age remained unchanged at 31, the same it has been for three years in a row. The median income was $69,400, up from $68,300 in 2014, but well below the $98,7000 earned by the average 53-year old repeat buyer. They were only able to muster a median down payment of six percent, compared to 14% for repeat buyers, and purchased a rather small 1,620 square foot home, though it was up from 1,570 in 2014. The average purchase price for a first-timer was $170,000, compared to $246,400 for the repeat buyer who was able to stretch out in a 2,020 square foot home. The primary reason for a first-timer to buy was the desire to own their home, the same reason for repeat buyers who also indicated an equal desire to go bigger. First-time buyers plan to stay in their homes for 10 years, while repeat buyers expect a 15-year tenure. If you’re looking to buy your first home, know that it has become a lot more competitive these days, so merely qualifying isn’t always enough. Being able to come up with a larger than necessary down payment can certainly help, and showing the seller you’re pre-approved for a mortgage is also a plus, if not a necessity. Repayment of existing loans, especially student loans, along with the increase in down payment, has brought down the share of first time home buyers to an all-time low in the country. The situation seemed inevitable, given the existing debt, increase in asking price with a combination of high rent, which makes it difficult for buyers to finance their down payment. During such times, home buyers need to move from conventional ways of residential financing and look for a company that provides other customizable ways of financing a home loan and paying mortgage.